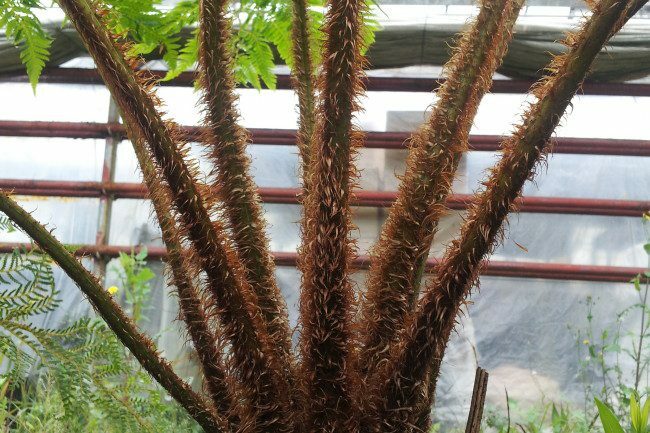 Cyathea brownii is probably the largest tree fern species in the world. It is endemic to Norfolk Island, in the Pacific Ocean near Australia and New Zealand. It gets its name from the botanist Robert Brown (1773-1858). In natural habitat Cyathea brownii can reach up to 20 metres or more in height. The broad, lance shaped, bipinnate-pinnatifid to tripinnate fronds can reach 5 metres in length. The stipe is long and has a line of white, stitch like dashes along its length. Rachis and stipe are covered in white-brown and darker orange-brown scales. The trunk can become smooth with age and may display oval scars left from fallen fronds. This spectacular tree fern enjoys a sunny position. Planted in a semi shade position, and protected in winter, this plant will makes a fine addtion to any garden. Hardiness: Not a hardy fern in almost every part of Ireland and Britain. It will only tolerate temperatures of down to 0 celsius. It will need winter protection to survive or grow in a pot and take indoors over the winter period.